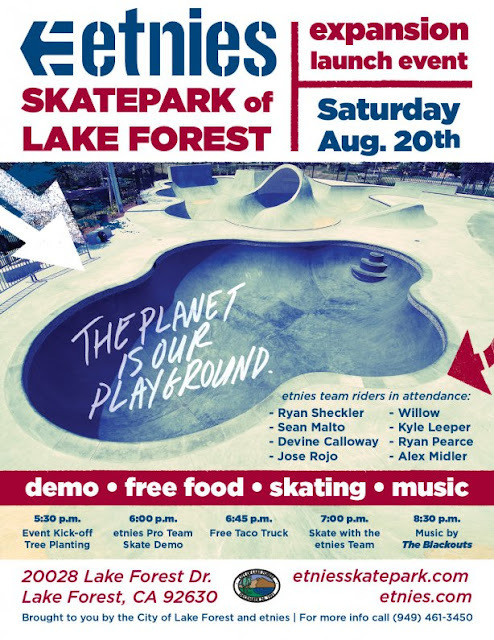 Tomorrow Saturday, Etnies Skate Team riders such Ryan Sheckler, Sean Malto, Jose Rojo and Kyle Leeper will jam over the world-class cradle and the newly redesign skate park of Etnies of Lake Forest. The event starts at 5:30 when Lake Forest Mayor Peter Herzog, City Manager Robert Dunek and Etnies owner and Senizergues will plant a tree as a symbol of replacing plants and trees moved during expansion. Since this is California, a taco truck (what else) will have free food for everyone and music will be provided by the Blackouts, the original mariachis declined to come. A couple of days ago already, Kevin Kowalski, Pedro Barros, Ben Hatchell, Josh Mattson and Ben Raybourn joined Aaron Astorga, Mason Merlino, and Jake Reuter for a little evening test session of the new Etnies Skatepark of Lake Forest expansion. You can bet the park will be crowded with more pool rippers in the following days. The new Etnies skatepark is challenging and designed for the emerging class of concrete transition riders that are starting to get recognition in both the skate media and professional events and contests such as the World Cup. The new expansion has open a couple of days ago and is ready to ride after being torture tested by some of the best skateboarders in the world. The 19,000-square-foot expanded section includes features found at famous skate spots such as San Francisco's China Banks in Chinatown and Pier 7 Ledge off the Embarcadero, where many skate videos have been shot. There's also a back yard-style pool modeled after one in Riverside popular with skaters in the 1970s. But that's the 16-foot-high by 8-foot-wide cradle which is the expansion's marvel, only the second craddle in southern California (after Fontana Skatepark). The $800,000 expansion makes the park the largest in the nation. About 60,000 skateboarders visit the park annually. Entrance is free, thanks to funding from the city and from skate park programs and camps. The original skate park was built for nearly $2 million in 2003. Initially the city had planned a typical 10,000-square-foot park, but Etnies owner Pierre-André Senizergues, founder and CEO of Sole Technology, stepped into the picture. Senizergues, a former professional free-style skateboarder from France whose apparel and shoe company is adjacent to the skate park proposed a joint venture between the city, and his companyand helped provide a world-class skate park where riders could skate for free on professional-level bowls and ledges. Senizergues donated money the first few years. With the park's success, the city opted to invest more to make it better. "It's amazing for me to see what a success the Etnies Skatepark of Lake Forest is for the community," Senizergues said. "To celebrate such a large expansion demonstrates the power of coming together and hopefully will encourage more cities to create skate parks as part of their communities." The Etnies Skatepark is definitely a must-ride for any serious concrete, transition, and pool skater.